Winter Season (Dec – Feb): On days when the temperature is -10℃ or lower, the changing of the royal guard ceremony maintains full scale presentation, however the number of guards on watchguard duty may be reduced. Summer Season (July – Aug): On days when the temperature is 30℃ or higher, the changing of the royal guard ceremony maintains full scale presentation, however the number of guards on watchguard duty may be reduced. Bad Weather (Heavy Rain or Snow): The changing of the royal guard ceremony may be cancelled while the duty of guarding the palace gates will continue to be carried out at Heungnyemun (Gate). During the Joseon Dynasty, the royal guards were responsible for guarding and patrolling the gates of the capital city and the royal palaces. The royal palace guards, who were known as the “WanggungSumunjang”, had the very important duty of protecting the king by guarding the entrance gates of the primary royal palace where the king resided. They were in charge of opening and closing the palace gates, inspecting all visitors, and maintaining a close surveillance of the palace. They were divided into day and night shifts, and the Changing of the Guard ceremony took place whenever the shifts changed over. 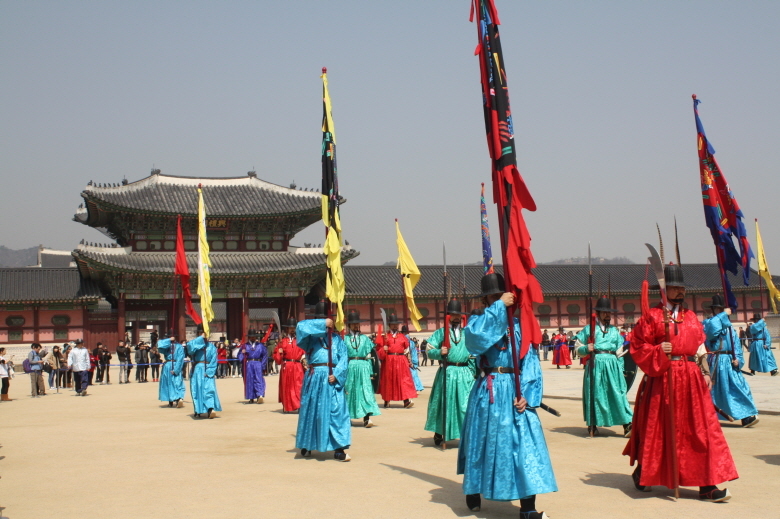 In the early period of the Joseon Dynasty, the Changing of the Guard ceremony was conducted at Gyeongbokgung (Palace) as at that time Gyeongbokgung was the primary royal palace and the king then resided there. However, in the late period of the Joseon Dynasty when Gyeongbokgung was burned down during the ImjinWaeran (Japanese Invasions of 1592 – 1598), Deoksugung was made the primary royal palace and the Changing of the Guard ceremony was then conducted at Deoksugung. After some extensive historical research, this splendid and elegant traditional Korean royal court cultural ceremony was first re-enacted in 1996 and has been a must-see among Seoul’s tourist attractions ever since. This ceremony is a great opportunity to experience a rare traditional scene in Korea, as the ceremony is reenacted exactly as it used to be held, with guards wearing royal uniforms, carrying traditional weapons and playing traditional instruments. A tradition comparable to the Changing of the Guards at Buckingham Palace, this ceremony takes place three times a day in front of Gwanghwamun, the main gate of Gyeongbokgung (palace) from 10 a.m. to 3 p.m. (except for on Tuesdays). 4. The third drumbeat signal sounds and the chief of the relieved guard unit orders his unit to exit the vicinity.